Eye doctors everywhere cringe when they hear that their patients are wearing contacts lenses for longer than they should be worn or not cleaning them properly. Whether you have been wearing contact lenses for years, or if you are new to this type of eye care, it is essential that care is taken for both the lenses themselves and the eyes. Dr. Sina J. Sabet, an ophthalmologist in Alexandria, has seen all kinds of situations where patients have abused their eyes and misused their contacts, which can lead to infections or even corneal ulcers. This can occur because the cornea only gets oxygen through the air, not blood vessels like other organs. The amount of oxygen that the eye gets is reduced when wearing contacts, and even more so at night when the eyelids are closed. When you visit an eye doctor, they can tell if you have been restricting the amount of oxygen that gets to your eyes. Under magnification, doctors can see swelling and little bumps called endothelial microcysts — so don’t think Visine will be able to hide the fact that you wore your contacts all night. 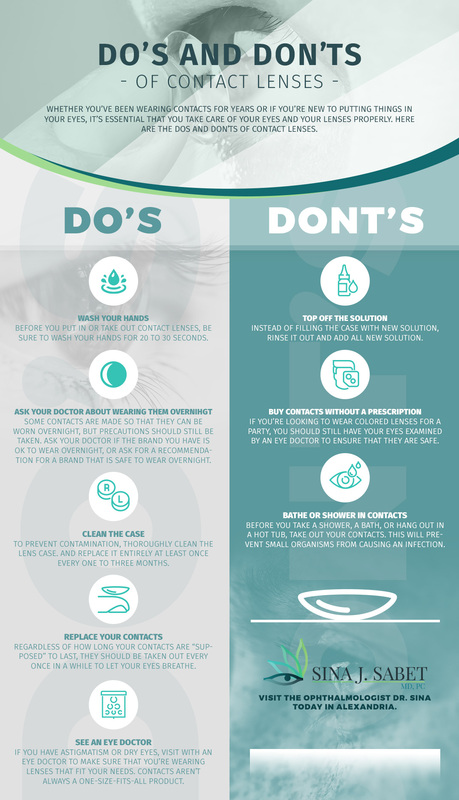 Before you put another set of contacts in your eyes, before you sleep another night with your contacts in, read these dos and don’ts about contact lenses. If your eyes start hurting or if they become red or inflamed, get in touch with the eye doctors at Dr. Sina J. Sabet. There’s a good chance that not many of us are washing our hands correctly. For soap to be effective, we need to wash our hands for 20 to 30 seconds. If you put in or take out contacts with germs on your hands, there’s a chance that the germs will transfer to your eyes, potentially causing an infection. 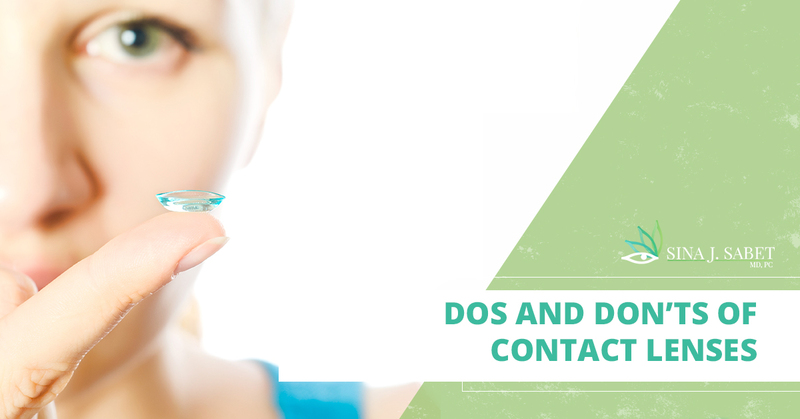 So be sure to not only wash your hands, but wash them thoroughly, before putting in or taking out contacts. You’ll also want to be sure that you’re using lotion-free soap, and then dry your hands completely. A study completed by Optometry and Vision Science states that, “Major factors that can reduce lens case contamination were washing hands with soap and water, air-drying lens cases, and matching of the disinfecting solution with lens case.” When was the last time you cleaned your contact lens case? If it wasn’t one to three months ago, it’s time. To clean the case, pour out old lens solution, clean each space in the case, rinse the case, wipe it clean with a tissue, and let it sit on a towel until you take your contacts out. By doing this, you can reduce the chance of contamination getting into the lens case. 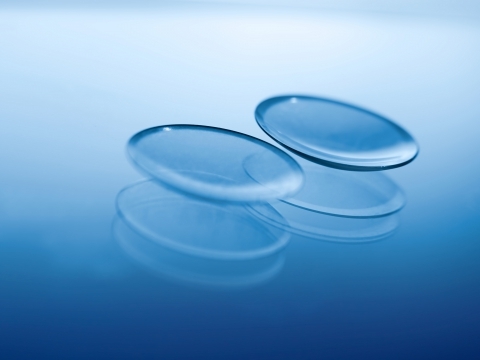 One of the most important things to note is that not all contact lenses can be worn overnight. Yes, there are some brands that let users do this, but they should still take precautions and be mindful of any changes in the eyes. A majority of ophthalmologists will advise their patients to still remove their contacts at least once a week, regardless of how long they are “supposed” to last. Before you go another night sleeping in your contacts, ask your eye doctor if they think it’s a good idea. Overall, doctors will recommend that users replace their contacts in a timely fashion. Whether you’re using lenses that should be thrown away every day, or lenses that are meant to last up to a month, it’s important to give your eyes a rest. The only exception is gas-permeable lenses, which can be worn up to a year because of the material they are made with. 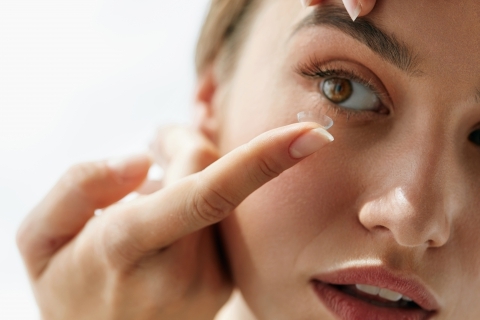 Contact lenses are not always a one-size-fits-all product. If you have astigmatism or especially dry eyes, you should see an eye doctor to make sure that you’re wearing contact lenses that fit your needs. In addition, when you schedule a regular visit with an eye doctor, they can find issues that could potentially lead to significant problems down the road. It can be tempting to simply add more lens solution to the case when there isn’t enough, but it is much safer to take the time to clean the case and refill it with new solution. When you add new solution to the old solution, or use plain water, it can lead to serious infections. Whatever you do, don’t use plain water, as it can severe pain. This one is especially important for people who don’t actually need prescription contact lenses. Colored or cosmetic lenses, even though they don’t do anything in terms of vision, can still be dangerous to use without the advice of a doctor. Because everyone’s eye is unique, an ophthalmologist should still exam the eyes before non-prescription lenses are worn. Whether it’s your morning shower or lounging in a hot tub, remember to take out your contacts before getting in. There are small organisms in water and they can eventually lead to an infection. We understand that this is another step that you have to take in order to keep your eyes and your lenses clean and healthy, but it’s better to take that step now than to develop an infection later. If you’re noticing changes in your vision and need an eye exam, get in touch with the team in Alexandria at Dr. Sina J. Sabet. We will make sure that your eyes are thoroughly examined to determine if you need a renewed prescription for your contact lenses and to ensure there aren’t any signs of future problems.